Love this...I love anything with a Santa silhouette! I have never watched a Hallmark movie either...or Diehard, LOL! Maybe I should expand my horizons...although I might watch the Chronicles movie this weekend while decorating my tree!! I know there will be those who are offended by this... but if you've seen one HMM? you've seen them all! But - if it's a good cry you're looking for - Hallmark's your station! Die Hard? that so surprises me! I did watch the entire series. Want a bit more Bruce? Try "The Kid" it's got it ALL! So the reason I stopped by... LOVE your card love, loVE, LOve it!!! Santa is everywhere! Love him flying over that big city....cute scene you created there and great with the inspiration picture! Love your take on the inspiration photo, Linda! Your Santa and reindeer are perfect with the modern city below, and your sky is beautiful! I consider Die Hard a Christmas movie, too :) and I love it! Thanks for the heads up on the Christmas Chronicles...I've bookmarked it for the weekend! My favorite Christmas movies are the Rankin/Bass ones The Year Without a Santa Claus and Santa Claus is coming to town - none of that Hallmark stuff for me! Your card is a classic iconic Christmas scene. And fabulously done! I love this beautiful Christmas scene! Your background is gorgeous. As for Christmas movies, I prefer Christmas Vacation and Elf -- they make me laugh every year. What a fantastic holiday scene. Wow! 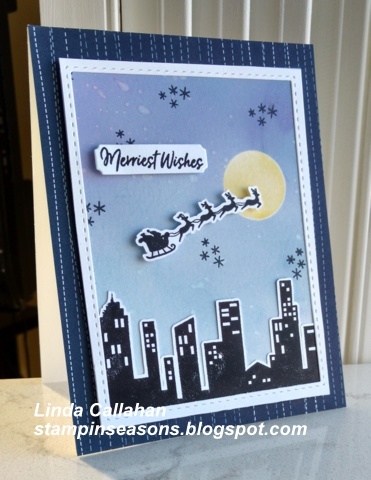 Such a gorgeous Christmas Card you have created! Thanks so much for joining us at Stamp, Ink, Paper for our Holidays Card Challenge this week! I've not seen The Christmas Chronicles so must hunt it out and give it a go. I don't do soppy so thankfully we don't have Hallmark here! 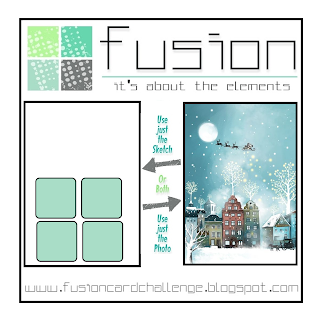 Your card is perfect for the challenge - so fun! Linda your card rocked the inspiration photo! I LOVE the Diehard Series and watch them over and over and over. I can't say I've never watched a Hallmark movie, but definitely cheesy ... and... you always know the endings! so give me Bruce any day!. Hugs. Oh my gosh! What an adorable card! I love the scene you have created. I love the skyline. Great placement of the reindeer and sleigh in the sky! Thank you for joining us at Festive Friday! I've never seen a Hallmark movie of any kind, but I love your inspired card. It's just wonderful! I LOVE the bright moon among all the darker colors in your scene. Beautiful design!